Got both the $7,000 question and the $30,000 question. June was named for the Roman Goddess Juno. Thank you for sending me these questions. In the excellent Princess Leia's Stolen Death Star Plans, a mash-up of Sgt. Pepper & Episode IV, a parody of "Being for the Benefit of Mr. Kite!" 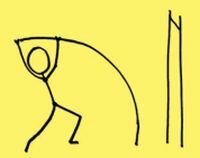 represents the cantina scene. That track is 7 of 13 on the album, so I would have felt pretty good using that to confirm my gut instinct/play-by-play of the opening of that film. 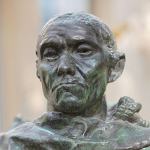 Worth reading this just for the listening recommendation. Good quality earwormy stuff. Thanks! I know she was nervous but i think she held her own well, she had a good feeling about the +1 question, but she did know for sure, and she knew that I definitely would know. Yea it would've been nice to help her later in the game. I know she felt she could do better, but the game is not easy and i think she made the right choice. I agree with you, I watch basketball, and it had me thinking, I was pretty torn between two myself. I definitely want to give it a try myself and audition, it was a fun experience being there for her. I just pictured a drawing of a basketball; it was a circle with )|( in the middle. I figured that )|( divided it into four sections, each of which the equator cut in half to make eight. I remember staring at basketballs for a long time as a kid and remembered both that pattern and the two-halves construction of those, tennis balls and baseballs. It's so zen. Does a remarkable job of making the increasingly anxious shouts of "THROW IT!!" fade into silence. ...Why yes, I was always picked last. What of it? 25-year-old Harriet Weaver used her last lifeline, her boyfriend. I have a problem with this question. Clint Eastwood pulled the trigger after saying "well, do ya, punk?" but his gun was empty, so it wasn't really fired. Having shot Scorpio through the shoulder, Callahan reprises his line about losing count of his shots. Unlike the earlier encounter, Callahan does have one remaining bullet, with which he kills Scorpio when the latter goes for his gun. For what it's worth, there's also an instance in Terminator 2 where "Hasta la vista, baby" is said without an immediately subsequent gunshot. Nice find. It's been a decade or more since I watched Dirty Harry all the way to the end, and had forgotten how the final scene with Scorpio played out. Millionaire is back with new episodes and this thread was at the bottom of page 1. This is a question with David Vaughn using his +1. 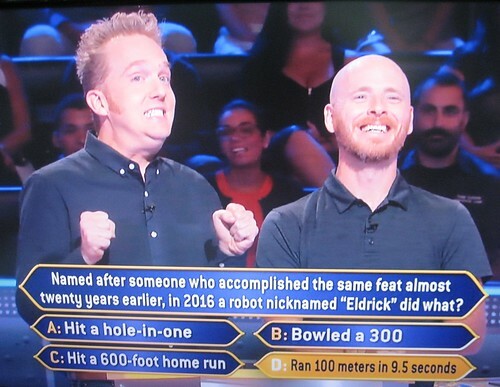 The correct answer was A: Hit a hole-in-one. David thought that at first, but was not sure and brought up his +1 who swayed him enough to switch to D. Eldrick is the real first name of Tiger Woods. Usually Chris does not give much away as I don't get the impression he knows a lot of five-figure answers. In this case I thought it was obvious the host knew the guys were in the rough. The 50:50 went unused. I have a feeling the 50:50 would have removed the two choices that have never been done by a person. En qué idioma está escrita esta pregunta? Well, Chris, yo estoy un hispanohablante, por eso la respuesta es ce, ¡español! 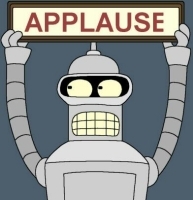 Fritz Holznagel was on today, back to going by Ryan. He used the ATA on the $5,000 question (New York's MOMA recently added to its permanent collection the 176 original emojis first introduced in 1999 by NTTDOCOMO, a phone company in what country? 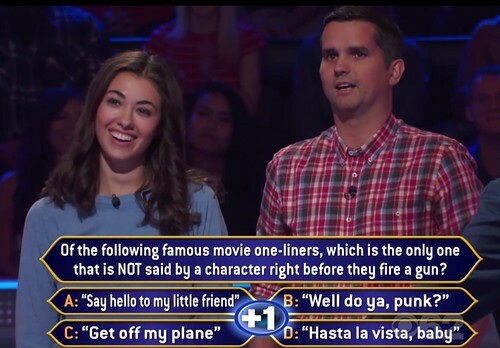 A. France B. Japan C. Sweden D. Germany) but got through, and answered the $7,000 question successfully to finish the episode while holding on to his other lifelines. 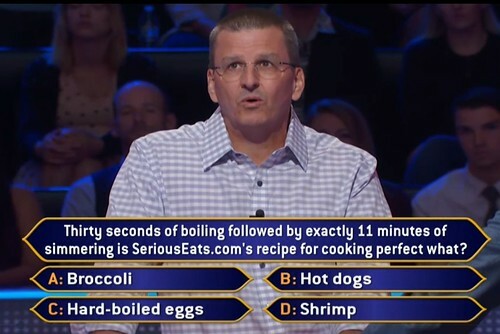 Ryan used the 50:50 which left B & C the hot dogs and hard-boiled eggs. Ryan worked through knowing the recent governors of OH & FL to narrow it. 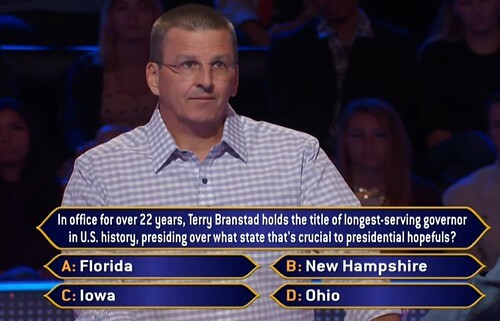 He went for Iowa in thinking if it had been NH he would have recognized the name. 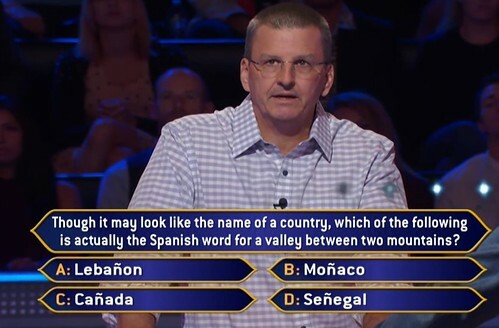 Ryan does not know Spanish, but could piece together canyon and Canada to go with C the correct answer. 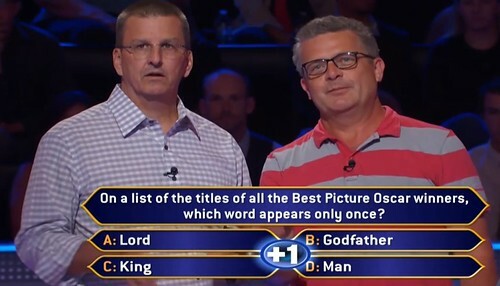 Ryan thought Godfather won twice and tried brainstorming movie titles with the other words before bringing down his +1 and last lifeline. The friend was not sure Godfather won twice and provided little help. Ryan walked with $30,000. She will return tomorrow going for $10,000 with her 50:50 & +1 lifelines available. Also All the King's Men. I would argue that the word "King's" is not the same as the word "King", in both your example and "The King's Speech". But the word 'King' still appears in 'King's' even if they're different words. 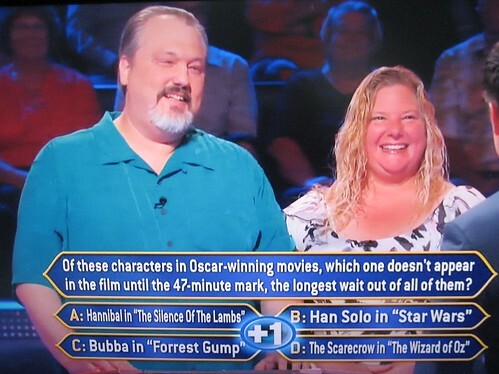 The movie question for $50k was very easy for me, but I would have been eliminated on $10k. As someone who frequently hard boils eggs, I would never in a million years use that method.